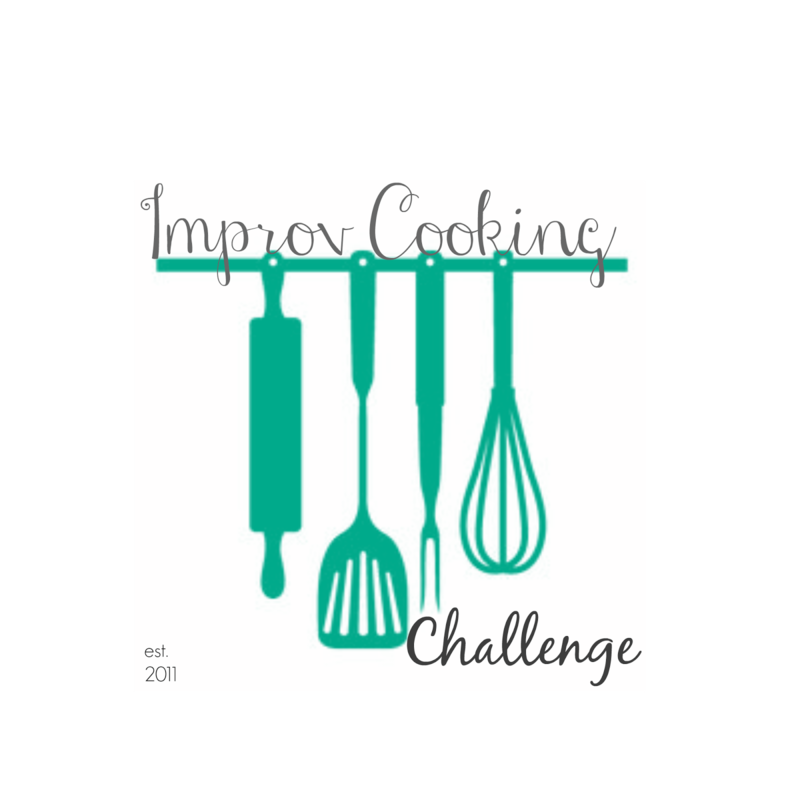 Happy Thursday and welcome to the Improv Challenge! 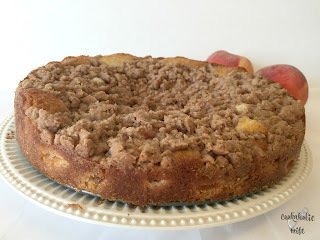 At the bottom of this post you’ll find a link up of all the other recipes the participating bloggers have made. Check it out! 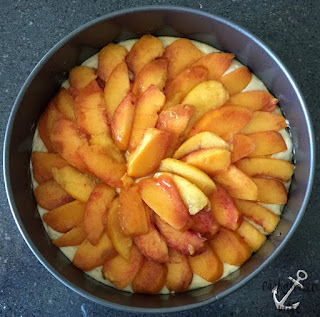 The theme for July is peaches and cream. I absolutely love peaches and simply hate that they have such a short season. I start hoarding them the second they come into stores in early July and keep buying more than I can possibly use right on up until the first week or so in September before they disappear. I always have stock piles of peach recipes to make because there are just dozens out there and the season for them is too short that I can’t possibly make everything I want to make in such a limited time frame! This is also the first month where I am hosting the Improv Challenge. I hoped that it would go over with no issues at all and instead I’ve done nothing but fight with my Inlinkz account because it refuses to allow me to share code. So much for smooth sailing, right? 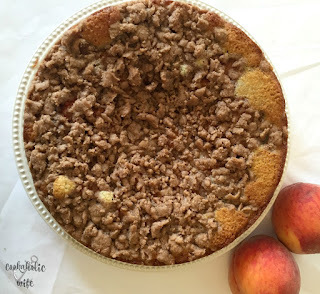 Confession: because this is the first month I’m hosting, I panicked and wanted to make sure that I without a doubt had a recipe to share with you that photographed well, I might have made 3 recipes. 😐 I’m only going to share one with you today, but you’ll see the other two shortly. 2. In a medium bowl, whisk together the flour, baking powder, baking soda and salt. 3. In the bowl of a stand mixer combine the sugar and butter and use the beater blade on medium speed until light and fluffy. Add in the eggs, one at a time followed by the vanilla. 4. In a small bowl or measuring cup, combine the buttermilk and sour cream. Add half of the flour mixture into the stand mixer, followed by half of the buttermilk mixture. Add the remaining flour and buttermilk until just mixed through. 5. Pour the batter into the prepared pan and tap on the counter to remove any air bubbles in the batter. 6. 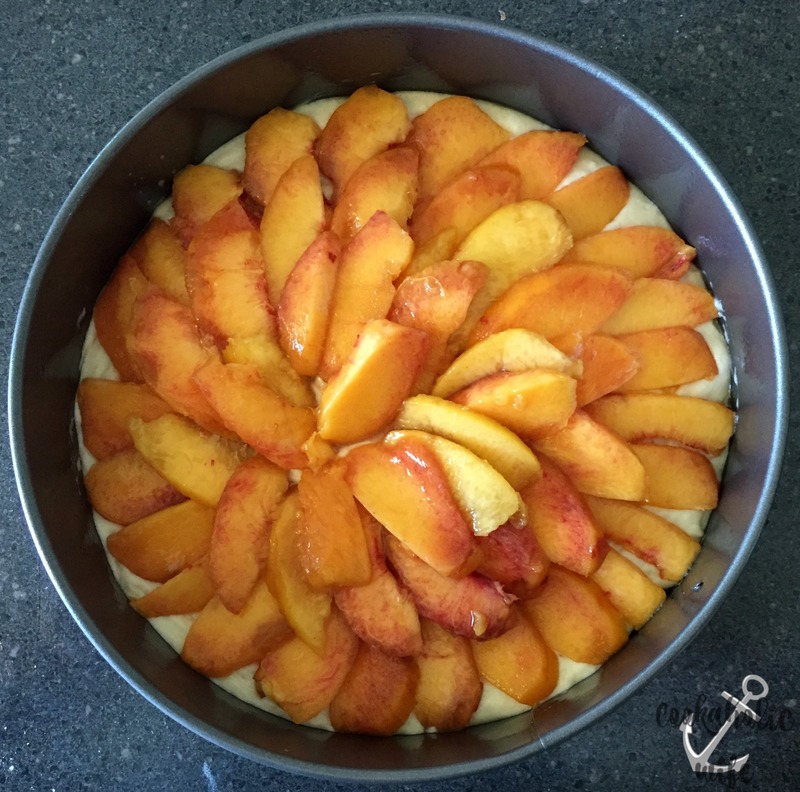 Arrange the peaches on top of the batter in a circle. 7. Prepare the crumb mixture by whisking the flour, brown sugar, sugar, cinnamon, ginger, nutmeg and salt together in a bowl. Add the melted butter and stir until combined and crumbs form. Use your fingers or a fork to break up large lumps if necessary. 8. Arrange the crumb mixture on top of the peaches making sure to cover it entirely. 9. Bake for 60-70 minutes or until a toothpick inserted in the center comes out clean. 10. Transfer the pan to a wire rack and allow to cool completely before removing the sides of the pan. This cake is absolutely delicious! 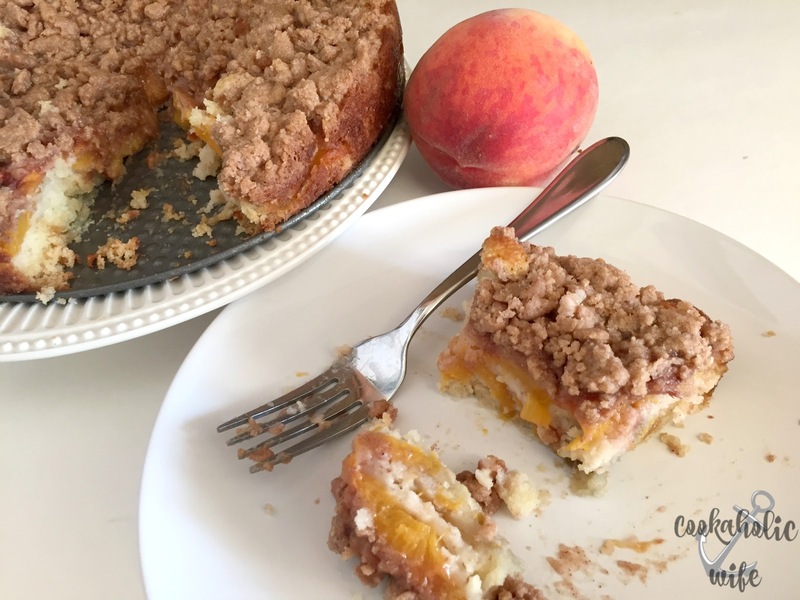 The batter is light and fluffy, the fresh peaches really shine through and the crumb topping manages to be light and dense at the same time, creating that perfect crumbly flavor. I love how pretty the spiraled peaches are. oh my….that crumb topping….sigh. You did a great job Nichole, hosting this group. Thanks so much for all your hard work. Great job Nicole. Can't wait to try it. It'll be a good excuse to pull out my spring form pan. Heck, I never need an excuse. IMHO it always a good time to bake a cake. 😊 Thanks so much getting this month's challenge up and running. Gorgeous cake, Nichole! The crumb topping is a great addition. I'm sorry about all the problems with Inlinkz! Hopefully it will be better from now on. Thanks again for taking over.